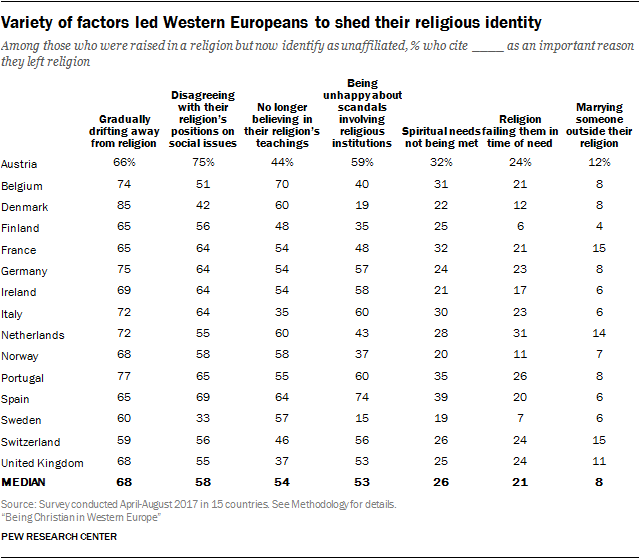 Most people in Western Europe identify as Christians. But across the region, fewer people say they are currently Christian than say they were baptized or raised as Christians. In every country, net losses for Christians are accompanied by net gains for the share of adults who say they have no religion. College-educated people, younger adults and men are more likely than others to say they are now religiously unaffiliated after having been raised Christian. Those who were raised in a religion and now identify as unaffiliated cite several factors as important in their decision to leave their faith. Most say they “gradually drifted away from religion.” Majorities also report disagreeing with religious positions on social issues, like homosexuality and abortion, as a reason they no longer identify with a religion. And at least half of respondents in several countries, especially in predominantly Catholic ones, cite church scandals. Across the countries surveyed, most adults identify as Christian, including eight-in-ten or more in Portugal (83%), Austria (80%), Ireland (80%) and Italy (80%). By contrast, the Netherlands has the lowest share of Christians in the region (41%). Religiously unaffiliated adults — that is, those who do not identify with a religion, but describe themselves instead as “nothing in particular,” agnostic or atheist – are a sizable population in the region. Still, of the countries surveyed, only in the Netherlands do religiously unaffiliated adults outnumber Christians (48% vs. 41%). Five hundred years after the start of the Protestant Reformation, most countries in the region are still either predominantly Catholic or predominantly Protestant. Generally, the Protestant countries have higher shares of unaffiliated adults than do Catholic countries in the region. For example, in Ireland, Italy and Portugal (all predominantly Catholic), just 15% of adults are religiously unaffiliated, compared with 23% in the UK and 30% in Denmark (both predominantly Protestant). Younger adults (those between the ages of 18 and 34), men and college graduates are more likely to self-identify as religiously unaffiliated, while older respondents (age 35 and up), women and those with less than a college education are more likely to identify as Christian. Even though majorities across the region identify as Christian, in every country surveyed, Christianity has experienced net losses as a result of religious switching. The vast majority of Western European adults say they were raised Christian, but significantly fewer in every country currently identify as Christian. The decreases in Christian identity are mirrored by increases in the shares who report having no religion. Christians have seen the most substantial net losses in Belgium, the Netherlands, Norway, Spain and Sweden. For example, there is a difference of 28 percentage points between the share of Norwegians who were raised Christian (79%) and the share who are currently Christian (51%), matching the 28-point gap between those who were raised unaffiliated (15%) and the current unaffiliated share (43%). In several countries, the share of religiously unaffiliated adults has more than doubled within the lifetime of the survey respondents. For instance, in Belgium, 12% of adults were raised unaffiliated and 38% report having no religion today. By comparison, the rise in the share of religiously unaffiliated adults has been more modest in Austria, Switzerland and the United Kingdom. Overall, large majorities of those raised Christian still identify as Christian today, but Christians have relatively low retention rates (the share of all people raised as Christian who are still Christian) in Belgium (65%), Sweden (65%), Norway (62%) and the Netherlands (57%). The overwhelming majority of those who have left Christianity now identify as religiously unaffiliated. 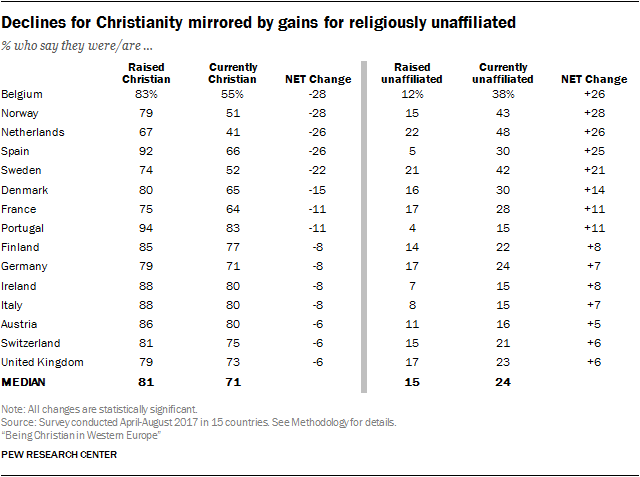 Similarly, the vast majority of those raised religiously unaffiliated stay religiously unaffiliated, but significant minorities in some countries now identify as Christian or with some other religion, or give an ambiguous response about their current religion. In France, for example, 88% of those raised religiously unaffiliated are still religiously unaffiliated today, while 8% say they are now Christian and 4% say they now identify with another religion or do not provide a definitive response about their current religion. 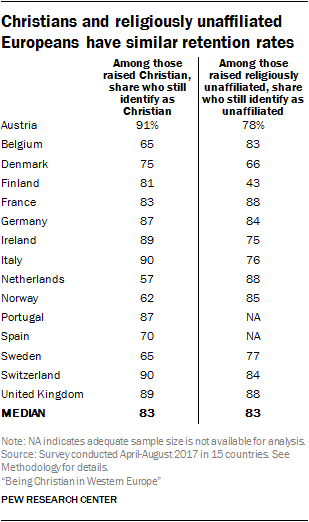 Among those who are currently unaffiliated, majorities in most Western European countries say they were raised as Christians. For example, 86% of current “nones” in Spain are former Christians, as are seven-in-ten or more in Portugal (74%), Belgium (71%) and Finland (70%). Former Christians who are now religiously unaffiliated are significantly younger and more highly educated than current Christians. For example, in Switzerland, adults who have left Christianity are considerably more likely to be younger than 35 (52% among former Christians vs. 19% among current Christians) and to have a college education (57% vs. 37%). Generally, the share of people who say they were baptized is higher than the share of people who say they were raised as Christians. Across the region, the vast majority of adults (median of 91%) report having been baptized, including nearly all Christians in several countries. 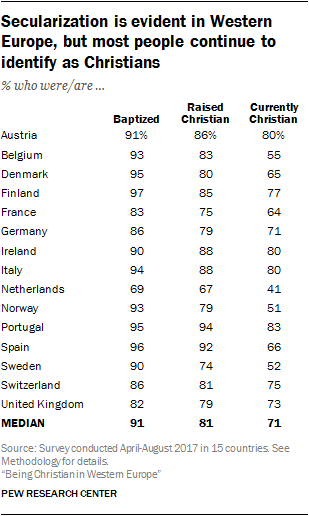 Even among religiously unaffiliated adults in the region, half or more in most places report having been baptized, including roughly nine-in-ten in Spain (91%), Finland (90%) and Denmark (88%). Why did unaffiliated people turn away from religion? The survey asked people who were raised in a religion but are now unaffiliated whether each of seven possible factors was an important reason for the change. Respondents could choose as many reasons as apply. The most common reason, cited by majorities across the region, is that they “gradually drifted away from religion.” In addition, roughly half or more in most countries say they stopped believing in the teachings of their childhood religion, or that they disagreed with their religion’s positions on social issues like homosexuality and abortion. Large shares (regional median of 53%) also cite scandals involving religious institutions and leaders as an important reason they no longer identify with a religion. This position is especially common in Catholic-majority countries such as Spain (74%), Italy (60%) and Portugal (60%). Smaller shares say that they stopped identifying with a religion because their spiritual needs were not being met (median of 26%), or that religion failed them when they were in need (median of 21%). Even fewer say marrying someone who did not share their childhood faith (median of 8%) was an important reason for shedding their religious identity. Focus groups in five countries explored how individuals’ religious identities, beliefs and practices have changed throughout their lives. Groups composed entirely of Christians or entirely of religiously unaffiliated adults shared stories about the role of religion during their childhoods. Many focus group participants considered themselves active Christians when they were young; they attended church regularly, prayed and held traditional religious beliefs. Several people in the groups said that when they reached their teenage and young adult years, they reduced their religious activity. Some turned completely away from organized religion. Focus group participants offered different explanations for how and why this shift occurred. A few participants pointed to particular moments when they lost faith and abandoned Christianity. Others said the attachment to Christianity faded gradually as they got older, with no particular turning point. Some mentioned specific disagreements with Christian teachings or disillusionments with church leaders and institutions, including recent scandals. Focus group participants commonly described their early interactions with Christianity in terms of going to church, praying and being brought up with particular religious beliefs and identities, (e.g., Catholic, Lutheran, Church of England). Many practiced along with their families. Some described religious aspects of their youth as something that was imposed on them, calling them a “chore,” “tradition” or “obligation.” However, some in the focus groups said they have embraced these practices in adulthood; they now attend church services, pray occasionally or hold some religious beliefs. They gave a variety of reasons for these changes, such as wanting to teach Christian values to their children. Others started attending church to be part of a community or sing in a choir. Some participants say they have resumed aspects of Christianity, like praying on a regular basis, without adopting other traditional beliefs and practices. While many of those who have left Christianity say they drifted away gradually, those who have returned to Christianity almost invariably pointed to a particular event, person or other circumstance that prompted them to come back to their childhood religion. And although participants talked about inconsistencies or contradictions in their religious practices – such as praying to God without believing there is a God – the group discussions typically revolved around an implicit assumption that Christians are supposed to attend church services, pray, believe in God, and mark key life passages (births, weddings, deaths) with religious ceremonies. Even as they talked freely about breaking these expectations – by seldom going to church, for example – the focus groups continually returned to the implicit paradigm, with each participant discussing the ways in which he or she adheres to or departs from it. The survey asked respondents about the religion of their spouse or partner. The overwhelming majority of Christian adults who are married or living with a partner have a Christian spouse or partner (median of 94%), and most unaffiliated adults who are in such a relationship have an unaffiliated partner (65%). 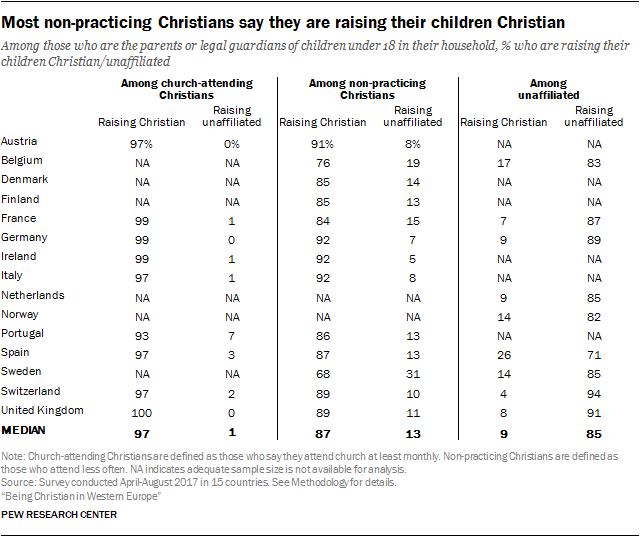 Religiously unaffiliated parents, meanwhile, are mostly raising their children without a religion, although 26% of unaffiliated parents in Spain say they are raising their children Christian.